The Missouri House of Representatives chambers during Gov. Jay Nixon's State of the State Address on Jan. 19, 2011. The House debated upon and passed the state's budget for next year yesterday. The Missouri House took only an hour to debate and pass the state's budget for next year. The $23 billion spending plan holds K-through-12 spending in place while cutting higher education funding by seven percent. 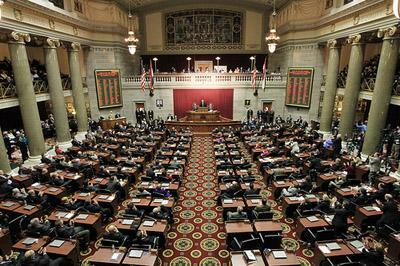 The full Missouri House is scheduled to take up the state budget the week of March 28th, right after lawmakers return from spring break. A task force focused on rural Missouri crime has recovered more than $2.5 million worth of stolen property in the past year and a half. The state Department of Agriculture says the task force has investigated 815 rural crimes since August 2009 and made 162 arrests. The task force investigates rural property damage, arson, burglaries and thefts of such things as equipment, fuel, livestock, chemicals and metal. Former Gov. Matt Blunt created a cattle theft task force in February 2006. It was broadened by Gov. Jay Nixon in August 2009 to include more rural crimes. A proposed constitutional amendment that would create a new lottery game to benefit veterans needs another vote before it can go to the Missouri Senate. The proposal received first-round approval in the House Tuesday. It looks to ask voters in 2012 whether they approve of creating a new lottery ticket, with the revenues going to the Veterans Commission capital improvement fund. Nearly 200 cats and dogs have been rescued from an animal rescued group outside Bonne Terre, Mo. The animals from the St. Francois Society were brought to the Humane Society of Missouri in St. Louis Tuesday. St. Francois is disputing the claims that the dogs weren't care for properly.